YRF launches the trailer of its biggest film Thugs of Hindostan on Yash Chopra’s 86th Birth Anniversary. This Diwali extravaganza “Thugs of Hindostan” promises jaw dropping action, visual extravaganza and a larger than life cinematic experience. The enormousness of the visual spectacle deserved a massive trailer launch that justifies the scale of the film. 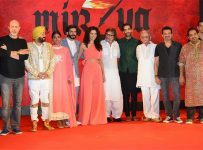 Thugs of Hindostan trailer, thus was launched on 27th September, Mr. Yash Chopra’s 86th Birthday Anniversary. The trailer was launched at the biggest IMAX screen of the country, Carnival Cinemas, IMAX Screen, Wadala, Mumbai.